After a few weeks of dealing with holiday travel, unseasonably cold weather, and a couple rounds of pollen-induced congestion, it’s finally time for another review! My holiday travel consisted of a trip back home to East Tennessee for Christmas, and while there I managed to pick up a few sticks that are not yet available at my local brick & mortar shop in Tampa. I bought a few of today’s featured stick at Smokin Joe’s/Old City Cigar in Knoxville – you can find them HERE, but they don’t appear to keep their site up to date in realtime – it seems to be more of an informational website. Give them a visit in person if you’re ever in town, though. They have a great selection and friendly helpful folks to either point you in the right direction, or just chitchat if you have a few minutes to hang out and smoke. I bought 5 of the Corona Gorda size, and at the time of writing this is the third I’ve smoked. I gravitate toward corona(ish) sizes, so this is a natural match. Each have been flawless in construction. Moderately veiny, but not “rustic” in appearance. The draw has been astoundingly perfect…a “goldilocks” draw for me. Not too tight, not too open. Just right. Before lighting, the aroma and cold draw are nothing fancy. If pressed, I’d call the flavor sweet leather and mildly grassy. 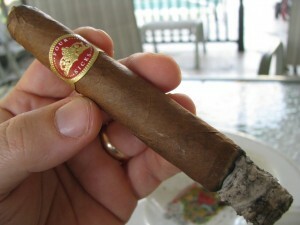 But mostly, just honest-to-goodness tobacco nicely assembled into a worryfree cigar. 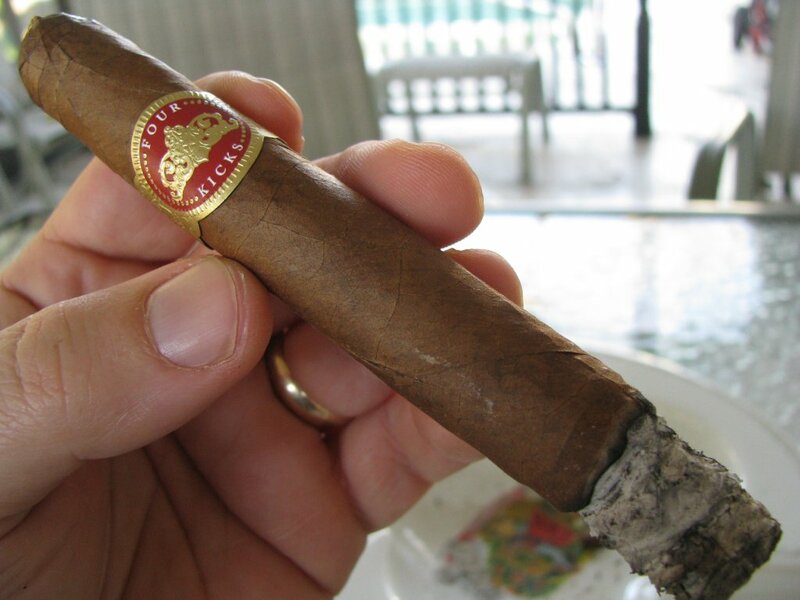 It actually reminds me of sticks I have mythologized in my mind from my early days of cigarsmoking 20 years ago; cigar experiences I remember being great, but rarely encounter today. Likely due to the impeccable construction mentioned above, the burn has been great on each of mine thusfar. A minor touchup here and there, but never enough to be bothered. The leather flavor from the cold draw weaves in and out for the duration, interspersed with slightly more astringent citrus – think lemon/grapefruit rather than sweet orange. 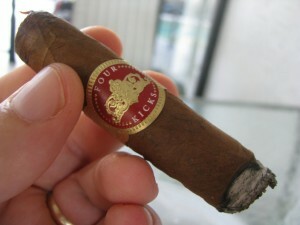 It is somewhat dry on the palate as well, and lends itself to keeping the head of the stick dry. I suppose that’s somehow related to the pH of the smoke…but that’s a discussion for another day. So…what is the verdict for Four Kicks? Does it live up to the fanfare? Is it worthy of being declared “a special see-gar?” Is it worthy of the shelf-clearing sales that have made it somewhat difficult to track down? My vote, which means little but can be guessed by looking at the nub to the left, is a resounding “yes!” The blog entry that created the desire in me to search for the Four Kicks also ignited a very specific vision, a craving even, for something I’d been unconsciously seeking for quite some time. 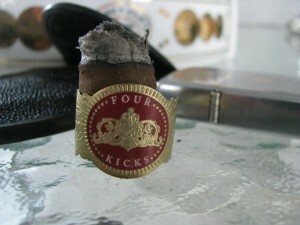 Four Kicks revealed what I had been looking for in a cigar, and then filled that niche. Call it marketing genius, fate, destiny…kismet even. I call it a damn good cigar. Often, I am motivated to recommend a certain cigar to a person based on the information at hand about what they enjoy or dislike in a smoke. I can’t think of a soul for whom I would not recommend Four Kicks. Maker’s Mark bourbon currently has a television commercial campaign entitled “It Is What It Isn’t.” This sums up the Four Kicks for me. There are no pretenses, no “angle” from the makers or marketers. 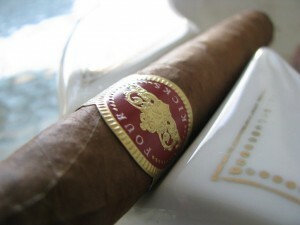 They’re just putting out an outstanding cigar at a fair price and letting the cards fall where they may. That is why I’ll be buying more.